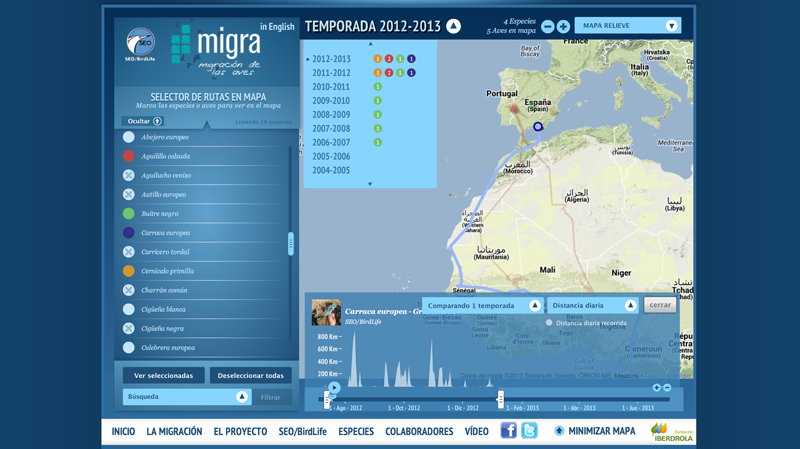 SEO/Birdlife contacted us to develop a bird migration site that could visualize the migratory routes of more than 3.000 species and several individuals for each species. 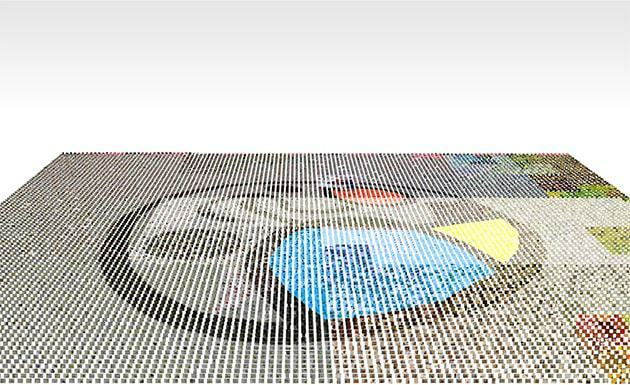 The biggest challenge in this project was obviously making an optimal visualization for this amount of data. The first decision was the site structure. 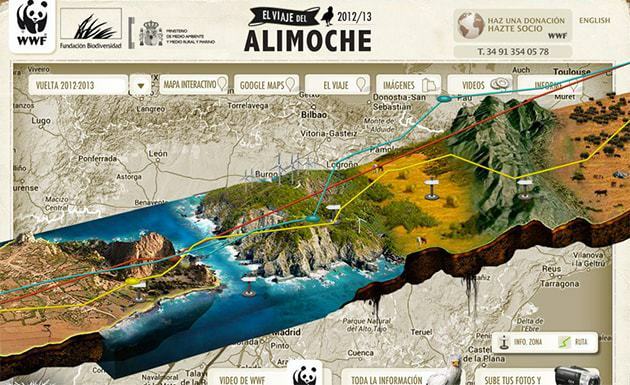 We had to find a frame that would allow to share a complex migratory route data visualization with an informative site about the migratory species in Spain. The solution was to create a hybrid structure where the visualization is shown at full scale but where all the content is actually in the home page. 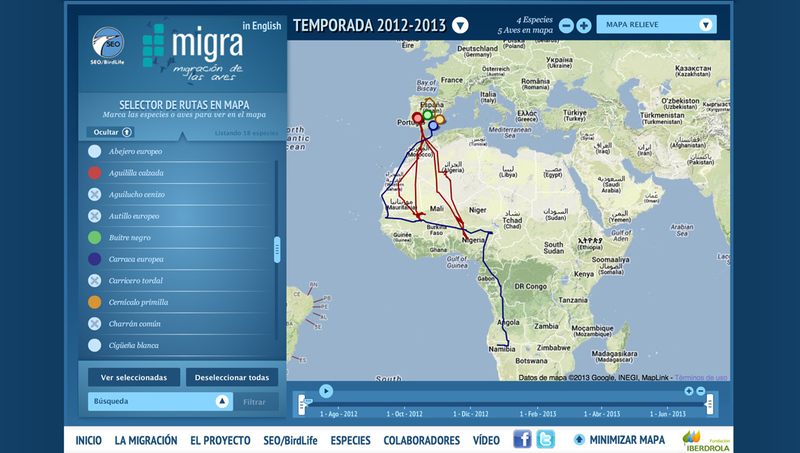 The migratory route's flash app allows the visualization of any route of any individual of any species. Through the selector browser the user can choose any specimen and see the exact route on the map. From there they can actually compare that route with the one of previous years or access data and statistics about that individual. The graph shows detailed data and statistics like distance frrom the starting point. You can also play with the timeline to show different time ranges. The user may actually choose any member of any species for all the years with data available and compare the migratory routes between two different years. You can also access a graph with a distance statistics over the selected period. 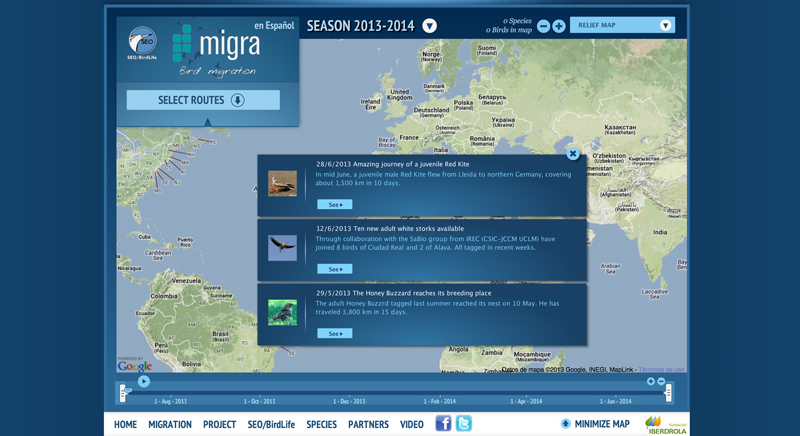 Choose any route and compare it with any other migratory season. The most recent data available is highlighted once you enter the app.